Sherry Anderson started curling when she was 8 years old on the natural ice rink at Northside, Saskatchewan and has been curling ever since. She began curling with her sisters, Jacquie, Avis and Susan in 1984 out of the Lakeland Curling Club in Christopher Lake. When Susan moved to Saskatoon they asked Donna Gignac to join the team. The first Provincial Sherry curled at was with Jacquie, Avis and Donna Gignac. Then the next year her sister Avis left the team and was replaced by Elaine McCoy. Lastly, Kay Montgomery replaced Jacquie. Sherry, Kay, Donna and Elaine would go on to win two provincial Women’s Championships in 1994 and 1995. In 94 and 95 the provincial format was the modified triple knockout. In 94 they won 2 of the events and defeated Leanne Whitrow in the final. At the Scott Tournament of Hearts in Kitchener they finished with a 7 and 4 record. At the provincial playdowns the following year they defeated Kathy Fahlman in the semi-finals and won against Michelle Schneider in the final. That year at the Scott Tournament of Hearts in Calgary they finished with a 6-5 record and out of the playoffs. In 1997 Sherry moved to Delisle. The first year she continued to commute and curl out of the Prince Albert Curling Club. After one year of that, she decided to get a team closer to home. She did some scouting in the Saskatoon area eventually teaming up with Sandra Mulroney, Kim Hodson and Donna Gignac. They began curling together in the fall of 1998. 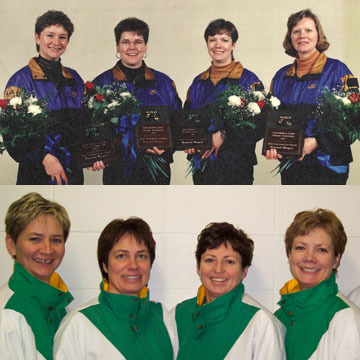 This Team became one of the top teams in the country on the bonspieI circuit and in 2001 they qualified to curl at the Olympic Trials held in Regina. They finished the round robin with a 9 and 2 record and lost the final to Kelly Law of British Columbia. In 2002 they continued to curl very well. They beat Michelle Ridgeway in the provincials finals to qualify for the Scotties. At the Scotties in Brandon they went on to finish 1st in the RR at 9-2. They beat Colleen Jones in the 1-2 game but lost to her in the final. In 2004 they were once again in the provincial final. This time in Meadow Lake. They defeated the Jan Betker Team to advance to the Scotties Tournament of Hearts in Red Deer. At the Scotties they finished with a record of 7 and 4 and lost a tie-breaker to Lois Fowler of Manitoba. Since first bursting onto the National stage in 1994 we have all had many opportunities to cheer for the Sherry Anderson curling Teams and we continue to do so.